As I begin to pen down my journey to my present profession of being a school teacher a myriad of images and thoughts cross my mind. Trying to connect the dots back to my school days, I can still visualize the crisp image of me playing Teacher – Teacher at home with my younger sister. Right from mimicking teachers by dressing like them and then enacting their teaching style at home, I now realize that somewhere in my subconscious mind my destiny was etched. I would be lying to myself if I say that I always wanted to be a teacher. My childhood ambitions fluctuated from being a lawyer, judge and even a dentist thanks to a painful episode of uprooting one of my milk teeth! Later as I crossed middle school, with a strong interest for humanities and liberal arts, I was really charmed by the life of foreign diplomats and I had made up my mind that I should prepare for Indian civil service exams to become an Indian Foreign Service officer. Honestly that was my first love and teenage infatuation has a vice like grip on a teenager. However at that point I ignored a crucial fact of my life which posed a serious threat to my dreams, which was growing up in a strong patriarchal family where the father decides everything right from what time you should wake up, to what you have to do in life and to whom you should marry. Since he was a chemical engineer, there was no other option but to accept his verdict of pursuing pure science stream in high school. Unrequited love and suppression does churn out rebels. By the end of my grade 12th, I had decided that I would pursue my graduation from a good college in Delhi university which would whet my appetite for liberal arts, something which I missed so much during my high school days. Naturally it was a piece of cakewalk for me to fail IIT entrance as I had already decided that I did not want to be an engineer!! My college years shaped the person that I am today. The professors did not stick to mundane issues of chemistry only. I still remember one of my 1st year Physics professor who used to ask our opinions on various social issues that plagued women and our society in general. That had a very deep impact on me and now that I am a teacher I try my level best to give students something to ponder upon at their home apart from just loading them with homework. On the contrary I started liking Chemistry thanks to my dedicated, liberal college teachers and at one point of time I had a temptation to come back to my college and teach, but I shelved that idea as my long term plan still remained the same of being a diplomat. It was 2007 when Indian stock market witnessed one of its glorious phases and I witnessed my struggling phase after completing my graduation. I was a freelance home tutor teaching chemistry to high school students while I was preparing for Bank Probationary Officer’s (Bank P.O) exam. I was just 20 years old and the official age required to appear for the exam was 21 years. As I became 21 years old I started giving the exams. Witnessing the economic turmoil I played safe by appearing only in PSU bank exams. At that point I thought that once I start working in a bank, I will save money to prepare for my civil service exams, but life had something else in store for me. August 2009 was when my Ache Din resurfaced in my life as I had started working in Canara bank as a Probationary officer. Armed with financial independence, I decided to push myself out of my comfort zone by learning a foreign language. Of course this was also fuelled by the fact that banking career in a PSU organization seemed to me pretty monotonous and dry. Hence when I received my service confirmation and final posting in 2011 in Indore, I enrolled for French classes in Alliance Française Indore. This was a turning point in my life. The early morning classes were the days I waited eagerly to attend. Apart from my classroom friends, I was blessed with an excellent instructor, Ms.Neha Bhagat. Her passion for French language and culture coupled with her Zen type personality enamored me and had a profound impact upon me. I still remember after my classes when I used to go for my work, I used to reflect my utility in banking service. I used to question myself whether in the long run would I be able to find nirvana being a banker. Whether I could find a purpose to my life working as a government employee either as a banker or a Foreign Service diplomat? While introspecting, I hungered for more and by the end of 2011, I knew that I would achieve atonement, by working in the education sector thanks to the impact that my language instructor and my college professors had on me. Though many people were scandalized by my decision and they warned me that it is not a very romantic decision, but I relied on my gut and now that I look back I feel that was the best decision of my life. I quit my banking services in February 2012 and I joined a startup education firm named English Helper Pvt. Ltd in Hyderabad. It was a unique and challenging experience in its own way as most of my company’s clients were affordable private schools where the tuition fee ranged from Rs 500 – Rs.1000 per month. My daily visits and conversation with the teachers and principals of those schools taught me how blessed my life was and how important it was to value simple things like power supply of 2 hours when most of the villages of Telengana used to witness power shutdown for continuous two to three days. 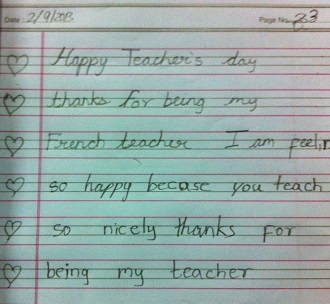 Apart from all this I was simultaneously pursuing my B1 level in French and I had also started applying for the post of French teacher in different international curriculum schools in Hyderabad. I was successfully selected and started working as a French language teacher to teach International Baccalaureate programme (IB) to primary students in Oakridge international school from May 2013. That was the launch pad of my teaching career and it became better every year from then onwards. The biggest break was when I got an offer to work in GEMS Education in Dubai after one year. I also finished my DALF – C1 level in French from Alliance Française Dubai. After a stint of 2 years and 3 months I returned back last month from Dubai to join a fully residential school which is nestled at the foot of Sahyadri hills in Lonavala, India. Since all the schools that I had worked were non residential schools, I thought this would be a unique opportunity to add to my learning curve. I would rate my overall experience in education sector and especially as a teacher as a very positive and fulfilling one. You never know when a primary school kid will hug you suddenly and without any reason. You will never come to know when a child will compliment on your dress even though you are wearing an ordinary kurti in school or even write a random thank you note for just being a teacher. I relived my childhood by looking at the world from their perspective. Their innocence and sense of humour taught me tenderness which I had lost in this race of life. My kids taught me to slow down, smile for no reason, laugh your heart out for further no reason and most of all to be honest to yourself by practicing what one preaches as students are the ones who will question right on your face if you don’t stand up for what you teach. Apart from all this I was also bestowed by opportunities to practice my leadership skills by taking part in extracurricular activities as I was the student council mentor of my school in Dubai and in my present organization I am the faculty advisor of Model United Nations club of my school. Yes I would say that not every moment is a rosy one. In the initial days I had to come out from the cocoon of my ideas that I was taught in my childhood. It was difficult for me to accept that marks are the only criteria to judge a student, considering that I was an academically bright student during my school days. With time I realized that intelligence can also be measured outside classroom and every student has some unique feature to be counted upon. I credit my change in perception to professional development workshops that I attended and by reading books and articles written by prominent educationists. In general a typical day would begin from 8:00 am and end by 3:30 pm. In the morning I generally review my lesson plans and other preparations for my lesson and keep things ready and organized to deliver my lesson. Apart from lessons a major part of the time is consumed preparing assessments, correction, maintaining records, lesson planning, supervising any cultural event, department meeting (never ending though as some SLT members just like the sound of their voice!) and preparing for parent conference. In general I work relentlessly to finish all my work before I leave office as I thoroughly believe in work – life balance, though I have seen many teachers complaining about work stress as they carry a pile of work back home. I never felt the heat probably because I work in the foreign language department which happens to be a skill shortage department and has a healthy student teacher ratio. Moreover I believe in empowering students by making them independent workers which automatically reduces the work load as they are not dependent on you for everything. In a residential school set up, there are times when I have to supervise the study hours during evening hours as residential schools exhibit more of community learning approach as everyone lives in the same premises and are a part of one extended family. The minimum qualification required to be a teacher is Graduation in a particular discipline that they want to teach. For Post Graduate teachers (PGT teachers) Masters in the relevant subject is mandatory. Many top notch international curriculum schools like Aga Khan Academy, Hyderabad, Mallya Aditi International School, TISB etc prefer candidates with M.Phil or even Doctorate degrees. Most schools demand a Bachelors in education (B.Ed ) degree, but of late the trend is changing. People without a B.Ed degree do get a job in schools but at a lower pay – scale. In my case I have not done my B.Ed as it was not required for a French teacher and since foreign language instructors are in high demand, it did not handicap me at all in terms of negotiating my salary. Instead of B.Ed, I pursued my Cambridge International Diploma for Teachers and Trainers (C.I.D.T.T) from University of Cambridge, while I was working in Oakridge Hyderabad. It is a one year online course divided into four modules which were application based as the assignment structured after each module expected me to apply my work place learning rather than just learn theories in education. Many international curriculum schools in India prefer C.I.D.T.T to B.Ed and some even sponsor their faculty members for this course. Remuneration in teaching job is not very lucrative and is the major reason why teaching sector cannot attract or retain the best of the talent. On an average a Trained Graduate Teacher (TGT) in a Tier –II city can expect a starting salary of say 15,000 – 20,000 (INR) per month whereas a PGT teacher can expect somewhere around 22,000 – 25,000 (INR). This is just a generic figure based on my experience as most private schools in India do not follow pay commission scales as recommended by Government of India. A lot of it depends on which city, which brand of school and which subject you will be teaching. Skill shortage subjects like Psychology, Foreign languages and Theory of Knowledge (TOK) attract better salaries. Many good schools also start off from Rs. 45,000 and go up to 1 Lakh per month based on the candidate’s teaching experience. Unfortunately I have even come across newspaper reports where private school teachers are paid as low as Rs 3,000 per month. So nothing is standardized. Vice principals after 8 -10 years of work experience can expect a compensation of around 50,000 – 70,000 INR per month and Principals can earn somewhere near a lakh or a bit more per month. Apart from educational qualifications and a strong command in one’s subject, a set of soft skills is required to be an effective teacher. Prominent among them are organization and clarity with an analytical bent of mind. One should have a high EQ as empathy and care is something that will be vital to deal with kids coming from disruptive background. An aura of self confidence, enthusiasm towards learning new things everyday and dynamism would give an edge, otherwise this job will just look like any other job and boredom will soon start slipping in. Most important public speaking, team working ability, wit and humor are the important skill set of a promising teacher. So if you are a person who is attracted by summer vacations, free education for your own children and other perks offered by schools, then teaching won’t be a rewarding career in the long run. Very soon you will start whining and feel miserable about your life. Teaching is all about soiling one’s hands by constantly learning, unlearning and innovating new practices and keeping oneself abreast with the latest pedagogical skills and of course sharing and implementing them in your lessons. If you are one of those who likes to be chained to your desk and check Face book status in every half an hour, then teaching won’t be a very entertaining option for you. There is so much to learn, absorb and implement that the day just flies in a jiffy. Also if you are a person who is very rigid about one’s belief system that you grew up with like stressing on marks rather than holistic learning or teacher centric learning rather than acting as facilitators to promote student centric learning, then swallowing new concepts in this sector would be difficult. One needs to loosen up their grip to invite new ideas. Teaching is a very demanding job. Think about a scenario where you have to deliver a lesson as well as monitor attainment in learning in 40 minutes to a class of say 25 students or even more of varying learning needs. This definitely calls for rigorous time management and organization skills. Apart from students you have department heads or boss to whom you have to convince your ideas and show your impact as a teacher. You need real patience, marketing and conflict resolution skills to win an over defensive parent to your side who can even pose a threat to your job as customer complaints are taken very seriously in any organization. Hence teaching can be an enormously rewarding career but it is not everyone’s cup of tea as work stress and heavy work load have forced new recruits to leave the job. Fear not it is all about how one views life. There are exciting career opportunities in this sector and teaching can act as a boon to achieve them. In the traditional way one can expect to rise up the ranks to become a department head, Vice principal and finally when one sports a salt-n-pepper look then one can expect to become a school Principal after 15 -18 years of teaching experience. Apart from this one can pursue higher education and aim for Doctoral studies to teach college or university students. One can switch tracks, for example in my case I can even work in a corporate firm as a foreign language expert. Since teachers have great communication and presentation skills, high levels of creativity, and lots of experience in dealing with difficult situations – emotional, pastoral, practical and logistical they can be an ideal fit for commercial sector where an education background would be an asset. Typical examples would be working in NGO, or education companies, film and theatre, counseling, humanitarian law firms, corporate and soft skill training and many more. The sky is the limit to spread one’s wings. Yasmeen Hossain left her banking job to become a school teacher. 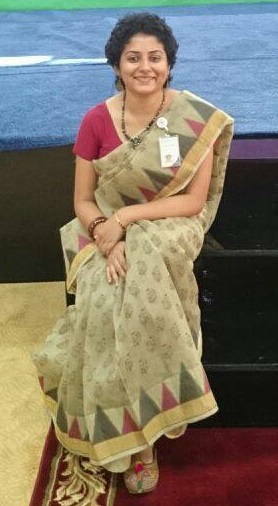 She shares her experiences, knowledge and views on the Indian education sector. What a motivational article! I am an engineer working since the past 8 years and am in a constant thought process of pursuing my dream of becoming a teacher. But never have had the guts to pursue what I want. Your thoughts and your experience have really inspired and motivated me! Thanks Parv. I am glad that my article inspired you to push yourself from your conventional lifestyle. I would like to quote Mark Twain ‘ Twenty years from now you will be more disappointed by the things you didn’t do than by the ones you did do. So throw off the bowlines. Sail away from the safe harbor. Catch the trade winds in your sails. Explore. Dream. Discover. ‘ .Wish you luck and courage to pursue your dreams. Thank you so much for appreciating my article. It really means a lot when people who read my article not only find it motivating but also helpful to realise their dreams. Goodluck for all your future hopes and aspirations. After reading this…my mind is totally blanked. Bcz I already did french hons from delhi University .but still don’t have job.. But really like youe article .. Your success is only depends on your hard work . Don’t lose hope. Try for master’s programme in French and keep upgrading your skills. A simple Bachelors degree only might not be of much help. Good luck for your future and thank you for liking my article. First of all thank you for taking out time to read my blogs and liking them. Now regarding contradiction , what I portrayed in my article ‘problems faced by Indian teachers’ was nothing but reality and pressing issues. Now it is up to you to consider that reality as grim reality or reality that bites and is hard to swallow. Every skill or profession has its own moments of euphoria and challenges. For e.g the same fitness training ,which most people find it hard to do it every day and even uncomfortable , releases endorphin and other happy hormones.So it all depends on one’s choice and perception at looking things. Hence for a mediocre teacher , teaching will always be perceived as a job or chore whereas for a good or great teacher it will be considered as a craft in spite of the daily challenges that the person has to face. Your article is inspiring.. I am very much interested in teaching especially school kids where you can imbibe changes and they can blossom into a great personality. I have expertise in I.T field but would like to take the deviation. Can you please guide me. You can start up teaching and pursue your teaching qualification while you are teaching. Hope this helps. Lovely read again!! Definitely motivating. Going to read the next blog you had mentioned. Thank you so much for your comment. Happy reading. Well written article. Most of the queries are cleared but some are still left. I am a biotechnology graduate from India and I am enrolled in a post graduate degree from Central University of Rajasthan and want to pursue with teaching career in Dubai (UAE) but the problem is I don’t have any experience in teaching expect a month teaching internship. What are the minimum requirements if I want to become a Biology teacher in Dubai? Thanks for your comment. Minimum requirement would be a teaching qualification like B.Ed or P.G.C.S.E in addition to 2 years of teaching experience. Very informative discussion and I am sure it will help many. I am working with an IB school for 3 years now and I m seeking job abroad. I teach business and management and I m 43 yrs. Do u thing there is a possibility of getting a job outside. Also looking at taking a PR. Please suggest if any other qualification is needed. Thanks for your comment. Yes you should definitely try to teach abroad and there are good opportunities abroad. Just ensure that you have the relevant teaching qualification. My heart-felt appreciation for your concern towards your job-seeking Indian Nationals. Your article reveals our nation’s long tradition of selflessness. Thanks for spreading our tradition worldwide. I would like to seek your guidance for my abroad venture. I’am Dr. Christy with my professional degrees like BA, MA, M.Phil, PhD all obtained in the field of English. apart from that I have also obtained my Diploma courses in D. Pharm [pharmacy] & PGDELT [postgraduate diploma in english language teaching]. Aged 46, I have 7 years of teaching experience & now i have desired to find an university English teaching job in & around the indian culture if not anywhere with decent salary. for the two years i am searching through net but invain . i don’t know where i lack in searching. Kindly can you please suggest the possible probabilities to find one . Thank you for your kind words. I assume for University teaching you need to qualify U.G.C NET. Apart from this your research publications and other documents would matter. Good luck. Hi I am Anupam.I have more than 20 yrs of teaching experience in India.My qualification is MA (Economics) B.Ed. from Indian University.I am teaching Economics to senior grade.I want to pursue teaching in US or in Canada.pl guide me how can i get through it.Thanking you for the same with a hope to get a speedy reply. The best would be to go through teacher recruitment agencies like ‘ Search Associates. Visit their job fairs that they conduct in major cities of the world. Plus you need to do PGCSE as B.Ed won’t help in these countries. Read your article. Thank you for such detailed explanations. I have an engineering degree in IT and currently working as an IT professional. I was looking for switching career which would allow me to travel, thats when TEFL/TESOL caught my eye as I like teaching as well. Can you kindly let me know its prospects in terms of pay, countries where Indians can teach (as I read in countries like Korea, Indians find it hard to get a job to teach english) and if it is a good move? Also, since I do not have a teaching experience but an IT experience (currently around 3.5 yrs), will that help? I have touched upon the pay package in my article. So do go through it again. IT experience won’t help as schools look for teaching experience. So some where you have to start teaching. I am pursuing MA in history from IGNOU. I am also preparing myself to crack UPSC civils and get into IPS .The problem is that currently I am employed at TATA STEEL,and the inflow of jobs income has made me averse to uncertainty. Can you please advice how would I be secure if I cleared UGC NET JRF or BEd from Delhi university. I need to get a government teachers/assistant professors job immediately Because I need to secure my future in case of any uncertainty in my UPSC journey. In India the qualifications that you have mentioned like UGC NET or BEd can help you with teaching jobs. Good luck for UPSC. Hai madam this is Harshavardhan I completed by BSc BEd and I am working for past 4 years as a teacher, can you suggest me what to do next for my trails to work in foreign countries. Please refer to my article on teaching abroad where I have given a detailed information about how to get teaching jobs abroad from India. A very inspiring article indeed. Your prompt helping replies convince me to post this comment. Ma’am I hold a masters degree in Geography and am NET qualified but want to teach at school. I am currently posted as a PO in one PSU Bank and I find a lot of similarities between my life now and yours in 2011-12 when you wanted to deviate and pursue teaching. I wish to have detailed guidance from you. I want to teach in an International School but I do not have a B.Ed qualification. Please if you could get in touch with me at my email id to guide me thoroughly, i shall be highly thankful. Thanks for your comment. Well you can apply to international curriculum schools as your NET qualification should act as an asset. Ma’am could you please list some International Schools who do not require a B.Ed degree as I could not find any. Firstly tons of thanks to your excellent article. It is crystal clear to me. Really i expect more useful article in upcoming days too. Here i have few queries regarding i feel you are the right person to clear my doubts as well. 1. I have done M.sc Biotechnology with B.Ed in regular , i have been working as a primary teacher since 2015 MAY, in a well reputed icse school in Bangaluru. I am interested in teaching jobs especially in Abudhabi. As you said GEMS would help me get a job in indian school as a primary level teacher? 2. Since my husband got selected as a contract employee in Abudhabi municipality GIS project under renewable visit visa around 6 month duration? It may extend more than tat stipulated time. Is that any possibility to change into work visa (pay is eligible) by our own? So i could get job easily i trust? 3.is that compulsory to have dependent visa to obtain teacher post? I m really confused and want to spruce up my career along with my kid-5+years old.? 4. Apart we have got saudi attestation in few of our documents because we had been there for 1 year. do i need to apply. seperately for other docs before i apply to gems?? Help me out. To be frank, I m the first working women in my family. And of course u r the right person to detail my queries. Kindly do the needful. hello by reading this article I realize that you have a good knowledge in teaching career i do also hope that you can give a solution to this problem ive come across with.The british council is offering a CELTA course in new delhi if i take this course will i get a chance to find a teaching job abroad im a science graduate and very confused about whether i get to join this course.Looking forward to your word mam.Thank you. I had read your article and found it very interesting.I m a B Tech graduate but still figuring out what to do with my life. Teaching is something that I love to do. I have been already working as a sunday play school teacher for past 4 years. I even tried working for corporate companies, but, I failed to enjoy my work. I never had any satisfaction. I did my B Tech as my parents insisted me to do so. I hated every moment but tried to complete with distinction. How can I start my full time teaching profession? I m good at biological sciences and maths and I enjoy spending time with children, I want to start my teaching profession in some international school.I need to know what is the eligibility criteria for those schools. I also want to study something that is related to teaching profession. Please help me with this. By reading this article, I realize that you have a good knowledge in teaching career, hope that you can give a solution for my daughter career, she is in 12th(commerce), her aim is to became a music teacher. If you could get in touch with me at my email id to guide me thoroughly, i shall be highly thankful. Hello mam . Thank you for sharing this . It’s a great article. But is it good to start in teaching proffession after completing the pg in computer science .. ? I mean without exploring the regarding field ? . Because I am in that kind of situation.. I love my teaching job but at the same time i feel like I am not challenged enough .. kindly tell you suggestion mam . I read a few of your articles while researching on a career change from media to teaching and I want you to know how much I appreciate the effort that you’ve put in. Currently I work as a freelance assistant director for tv ads but I’m looking at jumping into the educational field. I have a degree in Mass Media and I want to teach English at the primary level. I was thinking of doing an MA in Education from Azim Premji University, Bangalore. However, I’d like to know what you think would be the best way to go about it considering I have no teaching experience (except teaching English at an NGO for a year) and no teaching degree. Hello, Mam, This article is very informative for me. before this article, I have also read your article along with all queries named as “How to get teaching jobs abroad from India”. Right now I have a master degree in Mechanical Engineering from the reputed national institute and also have 3 years of experience of teaching in Engineering College and now want to switch to teach in abroad in a country like the UK, Kazakhstan, UAE, Australia and including all Europian Countries with the subject of math and science. I want to know which course is better for me between CIDTT and PGCE to get teaching jobs abroad from India to get international recognition.